Cooking can be hard. Sometimes it's more than art and pure joy but if you add all the effort and 'sweat' into it, the very result never disappoints. It was just like that in our today's kitchen play. Making tacos only looks easy and cheerful, but if you are doing it for the first time.. Well I will just say there was three hours of preparing, shopping, cooking and filming that was all intense and on the edge of disaster, but we managed to go all the way through it, and at the end, our Saturday's lunch included these six 'extremely' edible tacos that vanished into tin air in a fraction of just couple of minutes. Making tacos includes several parallel tasks and one of them was watching the tortillas in the oven during their seven minutes burn and they should be monitored closely to avoid over-burning. The color of our lunch today might went little more brownish I was hoping for, but trust me, they were extra crunchy and delicious nevertheless. Frying beef in onion rings took around half an hour and olive oil and spice mixture designed for lasagnas actually were great hit - the meet was extra spicy and beautiful. 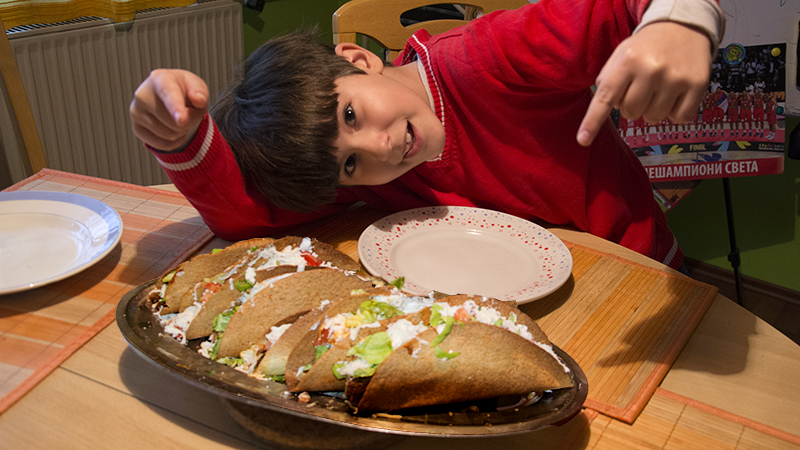 You can also use vegetables according to your taste, but grated cheese and sour cream goes extra tasty with fried beef, so try not to avoid them to get full experience of beef tacos recipe we used for this occasion, which you can also watch here: beef taco recipe. Second dish in our today's cooking thread is domesticated sausages and one of the old videos we made months ago. Last year we purchased manual sausage maker and believe it or not, this clip is our very first time of using it. Surprisingly, we mastered it pretty fast and result was.. Well.. Vanished in less than 15 minutes as soon as it was served on the table. All nine of them. Ingredients: minced pork meat, bacon, lemon, cumin, pepper, salt, marjoram, saffron, garlic, parsley. We actually barbecued sausages on charcoal but you can also dry them out for several hours with some 50 degrees Celsius in the oven to get something extra special or even combine - bbq them but not all the way - just let them soak little bit of smoke and finish in the oven drying them smaller amount of time - but they will end with very different taste. If you think sausages cannot taste better than this, and if you have a room with constant draft with temperatures lower than zero degrees Celsius for, say, two weeks, the same sausages can be hanged there and if ironed every second day their taste could be something you never tasted before. Check the related story here in the post Flat Sausage Fair.